Reviewing this book is bittersweet for me. It was just over four years ago when I reviewed Simply Irresistible here at The Romance Dish and first fell in love with the small coastal town of Lucky Harbor, Washington, where you can leave your front door unlocked and no one would ever touch your stuff, but you can’t keep a secret. I have since reviewed several of the other books in Shalvis’s popular Lucky Harbor series. Simply Irresistible is the first book of the series, so it has come full circle as One in a Million is the last. As with any series, some books stand out to readers more than others. One in a Million is one of those stand-out books for me. Tanner Riggs and his two best friends own and run Lucky Harbor Charters. As a team, they offer boat tours, scuba diving lessons, take people deep-sea fishing, etc. These activities are tame compared to what Tanner did in the past: going into the military right after high school and becoming a Navy SEAL and later being in charge of setting explosives on an oil rig. When his teenage son, Troy, comes to live with him, Tanner is thrown for a loop but is definitely up for the challenge. Callie Sharpe grew up in Lucky Harbor but moved away after her fiancé left her standing at the altar. So it’s a bit ironic that she now runs an Internet wedding site promoting happily-ever-afters. She may have a cynical viewpoint of what happens in the years following the wedding, but she sure is good at preparing for one. She returns to Lucky Harbor to check on her grandmother, who Callie’s parents believe is losing her mind. (Obviously they don’t know Lucille as well as readers do! Ha!) Callie wasn’t prepared for her reaction when she lays eyes on her high school crush, Tanner Riggs. How do you bring together two people who have given up on the idea of true love? With doughnuts, coffee, a hot-headed teenager, and a matchmaking grandmother, of course! I. Love. This. Book. I do, I love this book. I love Tanner. I love Callie. I love their hilarious meet-cute in the bakery. I love Tanner’s son and Callie’s grandmother, and I love Tanner’s and Callie’s sweet romance. Tanner was a bit of an adrenaline-junkie in the past, but an explosion on the oil rig changed him both physically (his leg was badly injured) and mentally (his good friend died). This causes Tanner to appreciate what he has and I love this about him. He was so real to me. And the scenes between him and his son were heartfelt and completely genuine. I have a teenage son, and while mine isn’t as wild and obstinate as Troy, I connected with Troy. Ms. Shalvis did a great job with his character. I also connected with Callie. She is a total introvert, who is clumsy and a bit socially awkward at times. I can so relate! I really enjoyed her reactions to the things Tanner would say when they shared coffee and doughnuts. Because she was left at the altar, I can totally understand her hesitation at her and Tanner’s friendship becoming something more serious. She doesn’t want to take the chance on having her heart broken again. Thank goodness for her grandma’s sage advice! Callie’s unconditional love for Lucille and their interactions was something that really grabbed me. Lucille is one of those truly unforgettable characters. I will miss her and her crazy antics! I could go on and on and on, but I want you to enjoy this book. I’m telling you, I loved it. As I said at the beginning, I’m sad that this is the last Lucky Harbor book. 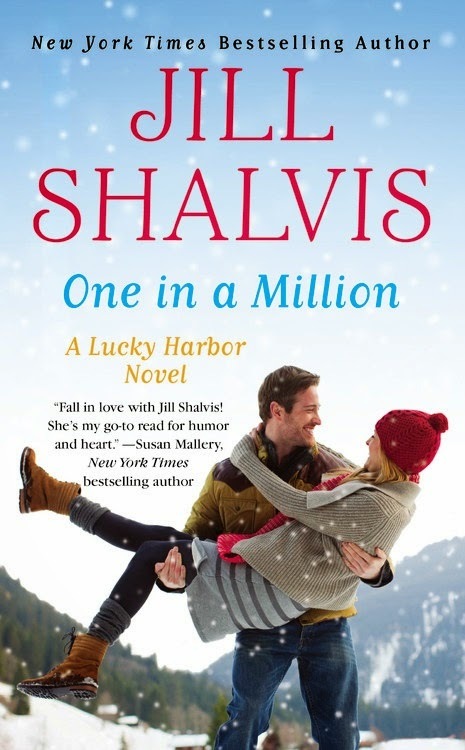 But, then again, if Ms. Shalvis wrote too many more books in the series, it wouldn’t be a “small town” anymore! So if you’re looking for a great contemporary series/romance, I heartily recommend the entire series, and, especially, One in a Million! I enjoy Jilll's books. I will miss the Lucky Harbor series. Loved your 5* review. I can't wait to meet Callie and Tanner. Looking forward to where Jill will take us next. Thanks, Laurie. I, too, look forward to where Jill takes us next! Great review, Andrea! Like you, I'm sad the series is ending but can't wait to see what Shalvis brings us next. I love Jill's books and am always sorry when a series ends. It must be hard to keep series books fresh. Whatever Jill has in store for us next, am sure it will be great. Am so happy she writes contemps - I love them. "Whatever Jill has in store for us next, am sure it will be great." I'm sure it will be, too, Pat! Terrific review, Andrea. I've fallen behind on the Lucky Harbor series, but I have heard so many raves about this last trio that it is clear I need to catch up. Thanks, Janga. I hope you enjoy them. I would totally be on board if Jill writes a new series loosely connected with this one! deerdoe, these do stand on their own, but if you're a stickler when it comes to series, then definitely read them in order. I hope you like them! I don't read a lot of contemporary romance but Jill is one of my favorites - love her sense of humor. I love this series!! I am actually re-reading it. Lucille's granddaughter is mentioned in the first book, although not by name. I am sure I will pick up other little tidbits as I read in. Jill also writes the Animal Magnetism series, just as good. Trish, I love her Animal Magnetism series, too! Her books are always on my Want To Read List, but some how I haven't gotten to them. I like small town stories and following a series. I will need to start at book one and work my way through in order. I have heard nothing but good things about her books and this review has convinced me I need to get started so I can enjoy this one. Thanks for another well done review.